Sherlock is a British crime drama adapted from Sir Arthur Conan Doyle’s Sherlock Holmes detective books. This report is about the second episode of season one of the series. Sherlock and Watson discover a Chinese antique smuggling operation in London after two smugglers are found dead. The smuggling operation is run by a Chinese gang called the Black Lotus. Throughout the episode, Chinese culture is made to seem extremely foreign by the way the white heroes react to it – they either react in awe at the novelty, or dismiss it easily. 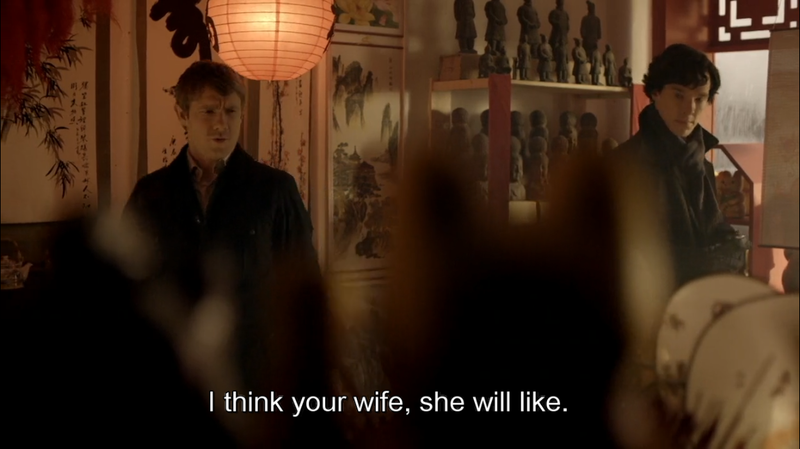 The majority of Asian characters shown are killers and are easily dispatched by Sherlock. No Asian male ever speaks. The episode opens with Oriental music to accompany character Soo Lin Yao (played by Gemma Chan) demonstrating a tea pouring to museum guests. She also speaks with an Asian accent. Soo Lin is also wearing a modern cheongsam (or qipao), a body-hugging one-piece Chinese dress. Soo Lin’s nerdy white coworker Andy Galbraith (played by Al Weaver) then awkwardly tries to hit on her. She declines his proposition saying, “You wouldn’t like me”, while her face is turned away from Andy, showing that she is not courageous enough to reject him face-on. In the eyes of the western viewer, an Asian characer MUST be accompanied by Asian sounding music and often needs to speak in a foreign accent. These stereotypes are old and over-used. Her outfit was not necessary as she could have been wearing any ordinary blouse at her job. However, the directors felt that her Asian-ness had to be emphazised with her wearing Asian clothing in combination with her accent and Asian music. Her choice of words when declining Galbraith’s advances make it seem like he should be passing judgment upon her and that she may not pass his standard. This is the classic trope of the Asian woman being meek. A more assertive response would have been, “I’m not interested”, which would show him that her opinion matters. 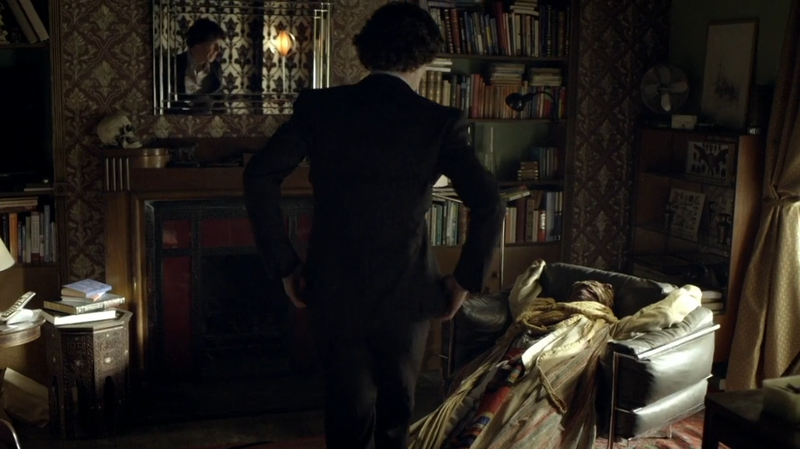 After the opening credits, at 00:04:00, a masked assassin wearing Arabian looking garb has broken into Sherlock’s flat. Sherlock is engaged in hand-to-hand combat with this assassin and easily dispatches the individual. This shows that white man can easily defeat anyone that is non-white (this is implied due to the Arabian-style outfit). As the episode progresses at 00:31:30, Sherlock and Watson arrive at Chinatown in London to investigate a lead. They enter an Asian antique shop named “The Lucky Cat.” The Asian lady that runs the shop is wearing a traditional cheongsam. 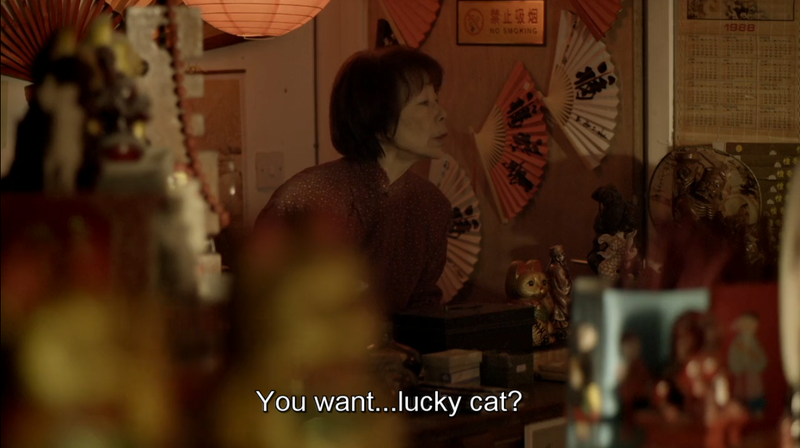 She speaks in an Asian-sounding accent, asking the pair if they, “want lucky cat?” while holding up a gold-covered maneko-neko, a traditional Japanese symbol. She insists upon selling the cat to Watson, saying, “10 pound, 10 pound, I think your wife, she will like,” even after Watson declines her offer. 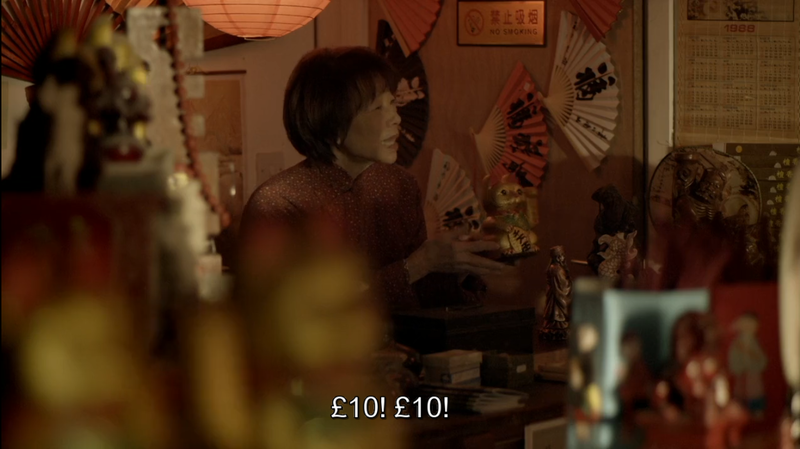 The directors deliberately portrays this Asian shop runner to be foreign in every way – speaking broken English, wearing old Asian garb, and being pushy to potential customers. Watson looks at her with a face that says, “I don’t care”. 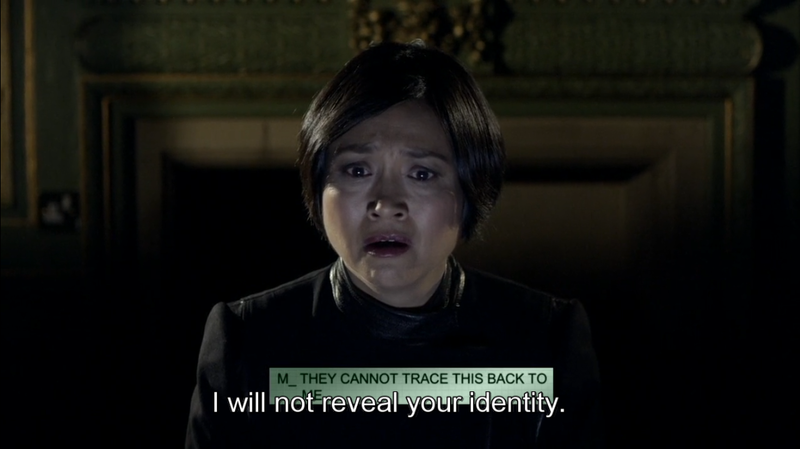 At 44:15, Sherlock finds Soo Lin at the museum and startles her. She drops one of the teapots she was holding and Sherlock nimbly catches it before it shatters on the floor. 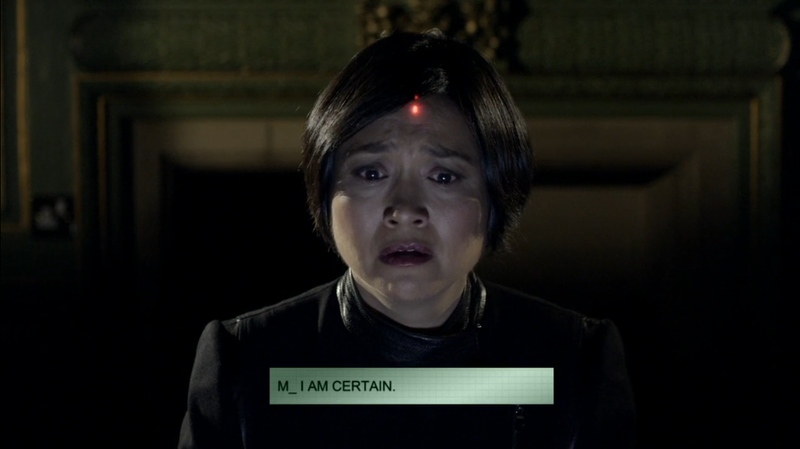 Sherlock and Watson continue to question Soo Lin about her stalker, Zhi Zhu (the spider), and several Chinese symbols that murders were connected to. She reveals that she used to work for a Chinese gang called the Black Lotus. Her stalker is part of the Black Lotus and is searching for her in order to kill her. Her speech is littered with the stereotypical accented English that western viewers expect. She continues on about her life and how she escaped China and working for the Black Lotus. She frames it as though moving to London was the best thing that ever happened to her as she could start anew. However, Soo Lin’s stalker has followed her to London. She reveals that her stalker is her brother and that he has become the puppet of the Black Lotus. The scene progresses with Zhi Zhu entering the museum at 00:51:00 and shooting Soo Lin after separating Sherlock and Watson from her. Zhi Zhu never says a single word – he simply kills. The subtle symbolism of Sherlock catching the cup before it shatters shows that the Asian woman needs a white man to prevent disasters. Her relocating to London as some paradise found repeats the old western trope about how moving to the west means an improved life because the east is so corrupt and backwards. It’s funny because that’s really not true. The idea that her own brother is hunting her down is an insult to Asian men as it shows how easily they are seduced by evil – they are willing to kill their siblings for evil gangs. The murder just cements this image of an “Asian misogyny” in which the Asian man tries to assert his dominance on an Asian woman. Her tragic death shows viewers what happens to Asian women in the hands of Asian men when white men fail to “rescue” them. These narratives are not harmless. Asian women internalize these racist and false images that widen the existing gender divide in the Asian community. 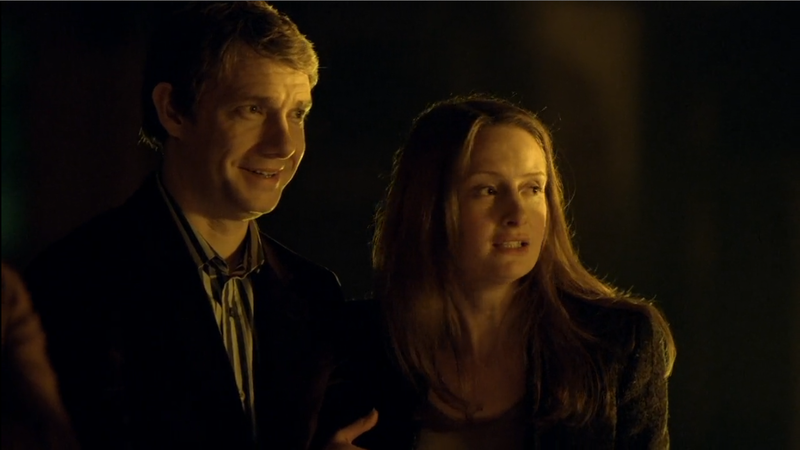 At 1:02:00, Sherlock, Watson and Sarah (Watson’s white date, played by Zoe Telford)) enter the tent of the Chinese circus in town. 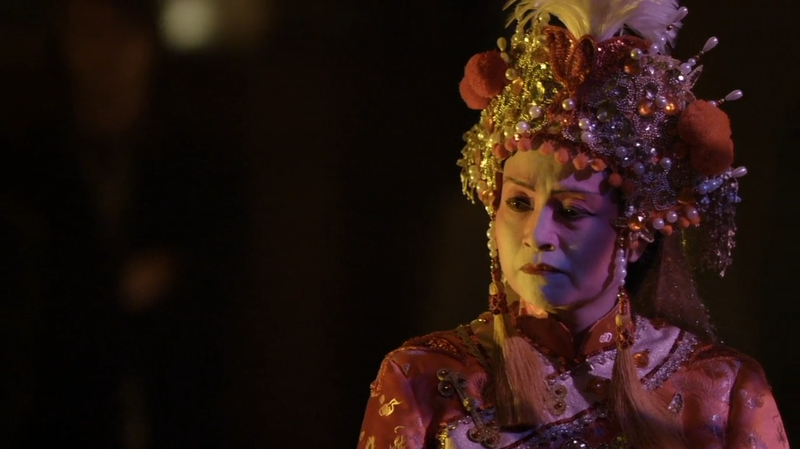 The woman introducing the first act (Chinese escapaology) is wearing traditional cheongsam and wearing ornate Chinese head-gear. The act is accompanied by traditional Chinese violin (erhu) music. Meanwhile, an Asian man is dehumanized, shown wearing a Chinese demon’s mask while being chained to a board and roaring in rage. The act is supposed to be one of him escaping before being impaled by a crossbow’s bolt. The crossbow is attached to a delicate string that will deploy once weight is placed upon it. The Asian woman stabs a sandbag attached to a string an pulley that begins to lower a weight toward the delicate string attached to the crossbow. The three white heroes look onward at the seemingly bizarre cultural act. Once again, the directors want to make Asian people as alien as possible by dehumanizing the Asian men and showing a barbaric and dangerous circus act. At 1:07, Sherlock snoops around the backstage dressing room of the circus act and he gets caught by another Asian man in a demon mask. The man attacks Sherlock with a sword while Watson and Sarah are enthralled by the act on stage. The fight progresses with Sherlock being kicked from backstage to the main stage. The demon masked man continues to attack Sherlock. Watson and Sarah team up to dispatch the demon masked man. The heroes escape quickly. This scene frames the white heroes as the victims of the attack that overcome the attacks of the villainous Asian man. At 1:18:00, the female leader of the Black Lotus, named Shan, captures Watson and Sarah. Shan is the same Asian woman that introduced the circus escapology act earlier in the episode. Shan thinks that Watson is Sherlock and attempts to intimidate him into telling her where a valuable Chinese artifact is located. She places Sarah in the path of the same crossbow shown at the circus earlier in the episode and stabs the sandbag. Sherlock enters the scene and fights a pair of Asian male thugs. He dispatches one thug easily. Watson saves Sarah from the crossbow’s bolt, which deploys and impales the last of the Asian thugs. Shan escapes and the three heroes go home. Later, Shan’s role demonstrates the emasculation and incompetence that her Asian male lackeys embody. Once again, the evil Asians plan to kill the white heroes fails. The last scene of the episode at 1:26:40 shows Shan communicating with a mystery man, M, through the internet. She is clearly M’s underling as she thanks him for his help. She then tells him that she will not reveal his identity in which he responds with, “I am certain”. A gun laser points to her forehead and she is shot dead. So, they’re communicatnig through the Internet but everything the Chinese do is so foreign, you’d think they were stuck in a time warp. We now learn the Asian leader was just a pawn of some other bigger entity. Later on in the series, we learn that M is actually Moriarity, Sherlock’s greatest foe, who is also white. Whites are established in superiority positions in roles for both villain and hero. In the entire episode, Asian men never speak and are dispatched easily while Asian women are either killed or are evil, but all the white people represent goodness. This would be hilarious if dying from drug addiction weren’t so tragic.